Many that know me, know that Pinterest is seriously my BFF! Before Pinterest, I hardly got any traffic to my site but after implementing a solid Pinterest strategy my site traffic skyrocketed rapidly. I went from having only 1000 page views a month to over 65,000 pageviews per month within’ a short amount of time. One of the main reasons why Pinterest ROCKS is because you don’t need a ton of followers to be successful on this platform. For example, one of my most repinned pins (listed below) was actually first repinned by someone that only had 47 FOLLOWERS and it went viral when they repinned it! At the beginning of my blogging journey, I had NO idea how to get traffic to my blog. I had a little following and hardly any traffic on my site. The only traffic I was getting to my site was from commenting on other blogger’s blog posts, and even that was pretty small in comparison to my traffic now. So, I decided to focus my traffic strategy on Pinterest, and my blog + business has forever since been changed. One of the main areas I focused on for my strategy was Pinterest SEO! 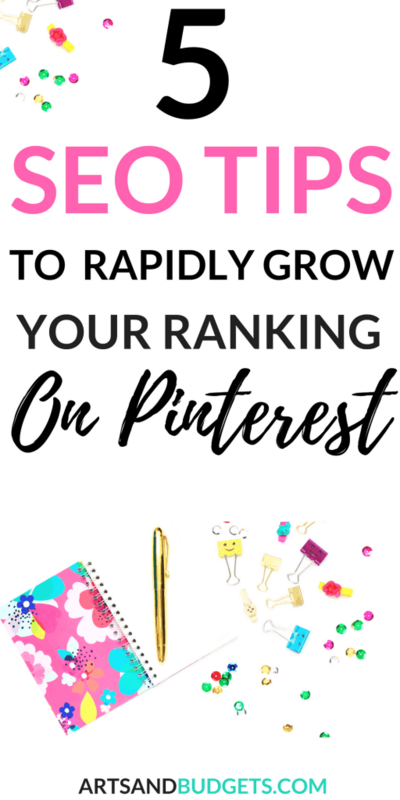 This post will share 5 Pinterest SEO tips that have helped me rank highly on Pinterest and boost my traffic. One of the biggest ways to grow your Pinterest account is to treat the platform like a search engine. While Pinterest is known as a social media platform it’s super important to treat it like a search engine. Think about it. When was the last time you went on Pinterest to message one of your friends or to post photos of your family and friends? It’s probably been a while or more than likely never. But, when was the last time you went on the platform to search for ways to grow your blog traffic or for ways to cook a recipe the right way? Probably more recent, right? That’s one of the reasons why Pinterest is more like a search engine because people often go on the platform to search for answers to their questions. Because of that, it makes Pinterest similar to the search engine, Google. Now, you might be thinking “ How do you treat Pinterest like a search engine. ?” There are 3 ways to start treating your Pinterest profile like a search engine. Pay attention to the smart feed: Pinterest has a smart feed that shows the most relevant pins FIRST and not the newest pins first. If a pinner doesn’t share quality pins (broken links, pin descriptions that don’t include doesn’t have keywords) it might be a little harder to get their pins shown on the smart feed. That’s Because Pinterest might think they don’t share quality pins and Pinterest wants to share the high-quality pins on their platform first. So, what is the Pinterest smart feed?? The smart feed is Pinterest’s algorithms! Which rates each pinner from highest to lowest. If you are one of the lowest they might not show your pins in the smart feed as much to your followers and other users. But, If you are one of the top pinners then your pins might have a higher chance to get seen in the smart feed to your followers and to the users that aren’t following you. Add keywords: Similar to Google, in order for your content to show in the Pinterest smart feed you must add keywords. That’s why it is important to find and use relevant keywords for your pin descriptions on Pinterest. Adding relevant keywords to your pin descriptions will help make your pins searchable and give them a higher chance to get seen in the Pinterest smart feed. A Keyword is a word or phrase that someone would use to find something online. For example, if I was looking for ways to make extra money quickly I might type in the keywords “Ways To Make Extra Money Fast.” in a google search. I wouldn’t just search the word “Money” because I probably wouldn’t find what I was looking for. So, when using keywords it’s better to be more specific over using general one-word keywords. Once you find your keywords add those to all your pin descriptions. The way I find relevant keywords to put in my pin descriptions is right on Pinterest. I simply do a Pinterest search with a focus key phrase such as “How To Start A Blog”. As you see in the example above, Pinterest suggests other popular keywords that a pinner can use in their pin descriptions. I normally take a couple of those extra added keywords and put them in my pin descriptions. In order to treat Pinterest more like a business page for your blog + biz, it’s a great idea to optimize your Pinterest Profile. In order to do that, I always suggest switching a personal account to a Pinterest business account. If you have an older Pinterest account just use that as Pinterest favors older accounts. Additionally, put who you can help and how you can them in your bio to let your readers know more about you and your brand. I have also found success in uploading a high-quality profile image as my main photo. I tend to use the same image as my main photo for all my social media platforms to stay consistent. 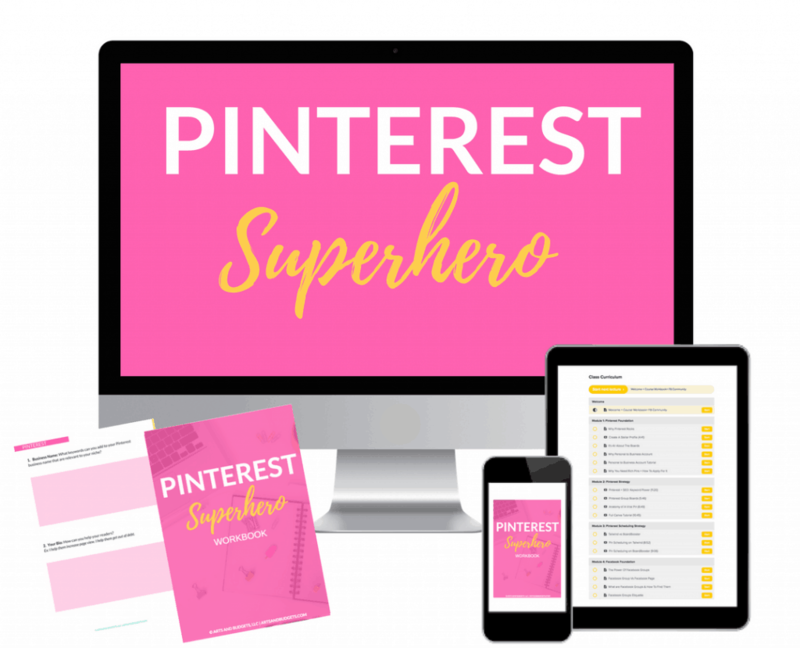 If you are really looking to dive into Pinterest SEO and keyword research check out my course, Pinterest Superhero by clicking here! This is a fairly new addition to Pinterest but Pinners can now use Hashtags to categorize their pins. Hashtags on Pinterest are a way for pinners to find the most up to date or current pins on Pinterest. Similar to how you use hashtags on Instagram, it’s a great idea to be very specific and descriptive when you use Hashtags on your Pinterest pins. So using hashtags that are relevant to your pins is a huge plus. How do You find Hashtags.? You find hashtags in two ways. #1 In the search engine: Simply go to your Pinterest page and type in the hashtags in the search. After you type in your hashtags and list of other recommend hashtags will appear. Simply click on the hashtag that you typed in. After you click on the hashtag that you put in the search box a list of the latest and most up to date pin posts will appear that have that hashtag in their pin descriptions. #2 Clicking on a hashtag in a pin description: When you see a hashtag in a pin description simply click on it and you will be directed to post that use that hashtag as seen in the example below. I would suggest putting hashtags at the end of your pin descriptions after your keywords. When you put your hashtags in your pin description, Pinterest will populate other popular hashtag suggestion for you to use. Create pinnable images that stand out: You can have the best content in the world but it will mean nothing on Pinterest if your pin graphics are not up to standard. To improve your pin image quality, focus on creating pinnable images that stand out (so think longer vertical pins). Add a catchy description: When creating titles for your pins it is very important to have catchy attention-grabbing titles. Focus on titles that include numbers such as “10 Ways To Lose Weight This month.” Also, focus on titles that explain how you are going to teach your readers something. Add keywords: Also make sure to add relevant keywords to your pins descriptions which will help them rank in the Pinterest smart feed. Another area to focus on is what you actually pin and how much you pin throughout the day. Pinterest wants to know they can trust your content to be helpful to their users so it’s important to pin relevant and helpful content throughout the day. Have you ever heard that the health of your Pinterest profile matters? Well, it surely does. 🙂 Since Pinterest tends to show the most relevant pins in the smart feed it’s super important to make sure that you repin other blogger’s content that can also be helpful to your readers as well. Pin throughout the day: I use Tailwind to pin throughout the day. Pinterest likes to know that you are active on a daily basis and not an internet bot. I go into more details about my total strategy and how it total increase my traffic to my blog in my new course Pinterest Superhero! Pin content with high Repins: I often search for other popular content on Pinterest in my niche daily. I simply go to the popular section on Pinterest and see what’s popular for that week in my niche. When I see a pin that has a lot of repins in my niche I repin that content to one of my relevant boards. You can also check out a site called repinned which will show you the posts with the most repins on Pinterest in your niche as well. Currently, to find how many times a post has been repinned I use the Pinterest app on my iPhone. Pin content to relevant boards: Since I normally pin content on blog growth and how to increase income, a lot of the content that I pin on Pinterest daily is related to those topics. I also make sure to pin those pins to relevant group boards and not just any random boards. For example, I wouldn’t pin a pin about growing a Pinterest account on a recipe board. Another important way to take your Pinterest profile to the next level is by adding relevant keywords to your business name, bio and Pinterest URL. In order to optimize my profile, I currently put keywords after my first name. I add keywords to my business name because users will be able to find my profile quickly in a Pinterest search if they search for the keywords I list next to my name. For example, since I have the keywords “Side Hustle” in my business name, my profile came up in a recent Pinterest search I did for “Side hustles” (listed below). This makes my profile more searchable on Pinterest. I also make sure to put relevant keywords in my Pinterest bio to let my audience know who I can help and how I can help them. So, there you have it!. Some Pinterest tips to enhance your Pinterest profile and grow your traffic this month. I truly adore Pinterest and I hope you do too. What SEO tips do you use for your Pinterest profile? These are such great tips, I totally agree with SEO being important for Pinterest! This is full of some amazing information! Pinterest is definitely something that I am not great at, but hopefully I can get a good grip with your help! Thanks! Latasha! This is seriously brilliant stuff. I am new to Pinterest marketing, or any marketing really, and your tips are going to be incredibly helpful to me. I’m enjoying your email courses too. Thanks so much! Thank you so much for this! I’m so new to Pinterest it’s laughable. The thought of learning of yet another social media platform…yikes! But I’ve heard such great things about it, it’s silly not to use Pinterest to the best of it’s abilities. I’ll be implementing your suggestions with others I’ve read. Thanks, again! Awesome tips! I have a question though – when Pinterest asks me what business type I am, what should I select? I’m currently listed as a “Brand”, but since I’m a cat care blog, I’m wondering if I would fall into the “Other” category. I don’t know! These are such helpful tips! I’m re-dedicating myself to blogging and it’s definitely a challenge to bring traffic to it, so thank you for sharing this, I can’t wait to implement your advice. So much great information about Pinterest SEO. I really appreciate the information on using hashtags. So helpful. I like reading about SEO and your article, Latasha, is a great piece of information. Very helpful, too! Thank you. Great post! So much great information, hashtags for Pinterest I have to start using. Thank you for that! SO happy to hear that this post helped! 🙂 Thanks for stopping by. I have just started using hashtags on my pin descriptions so I am still figuring it all out. Pinterest is something I want to get more into. These are really good tips, I didn’t know that pinterest had autocomplete on their search. Thanks for clarifying keywords for me. I know I have to step up my SEO game but it’s something I’ve never had any education on. I’ll get there! Thanks for these tips. I also never knew that Pinterest used hashtags ? Your blog is very effective. It seems like Pinterest is growing with Facebook and Twitter. This has been the most complete list of tips I’ve seen so far. Excellent and very useful tips. Thanks! Great tips that you have to shared. It is very helpful for my website. I really thank to you with the core of the heart. Thanks for sharing and keep it up. I’ve been personally using pinterest but I didn’t know that it is also a great platform for seo. Thank you for sharing this article. It’s a good thing to learn new things!